The treatment of atrial fibrillation continues to encompass a greater percentage of my practice. Sometimes I feel less like a cardiologist and more like an afib-ologist. The persistently rapid growth of this disease in our population boggles my mind. Really folks, this is not hyperbole; this is fact. Like all things cardiac, the focus is on treatment. Heart doctors fix stuff. Someday, way off in the future, when things have completely run amok, the voices of prevention, of lifestyle choices, will reach over the drone of ablation and medicines and cryo-balloons. For now though, few experts suggest connecting the parallel rises of inflammation, pessimism and over-scheduling with the disease of AF. 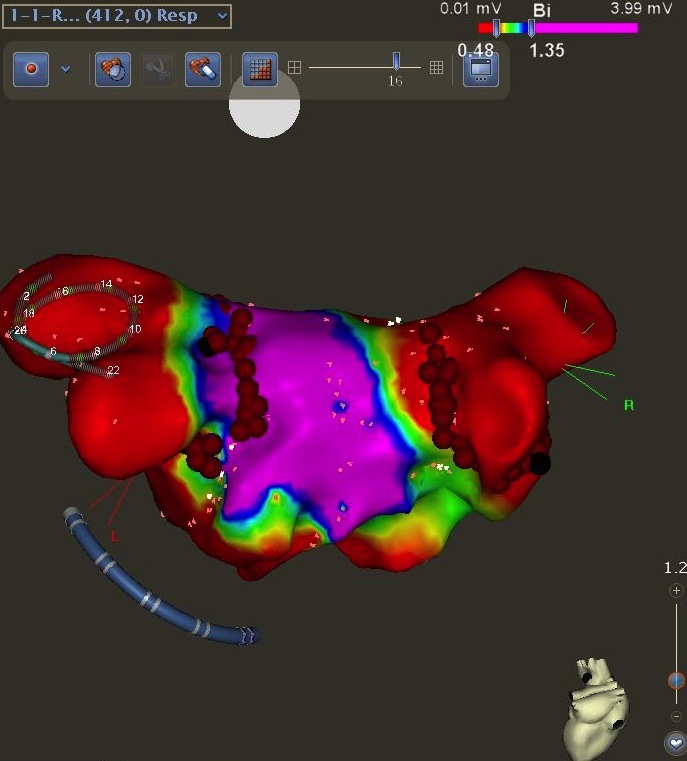 Last month, AF ablation made the lead article in the New England Journal of Medicine. That’s big. It was time, then, to put together another summary of where we are in the real world of AF ablation. The big picture here is that as the procedure gets shorter, safer and perhaps more effective, it will be offered earlier in the disease. This is a good thing because we know AF is a progressive disease, which grows harder to treat in more advanced stages. Here is my summary of the NEJM study and Ten facts about catheter ablation of atrial fibrillation in 2012. 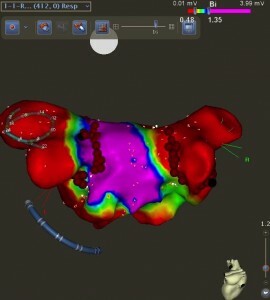 Here is a voltage map from a recent ablation of AF. The idea is to electrically isolate the pulmonary vein regions of the left atrium. Red means low voltage. The 3-dimensional mapping systems we use to locate the burns are marvels of engineering. What a treat (!) 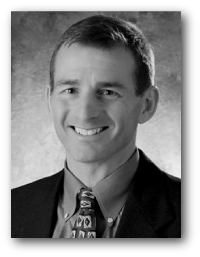 it is to have an experienced electrophysiologist review and update us on “state-of-the-art” of AFib ablation. This review covers concepts not found in textbooks (which are clearly outdated for this rapidly advancing field) – and it totally puts into perspective where things stand. The role of the non-EP-clinician is to understand what options exist for longterm AFib management. Prominent in that understanding is awareness of referral sources (and the experience of that referral site, since complication rate is directly related to operator skill and experience). AFib management has clearly evolved in recent years – and continues to evolve at lightning-like speed. Wasn’t that long ago that my local cardiologists were not aware of potential for cure of the disorder. No treatment is without potential risk for harm – but great to know where ablation now stands in the overall scheme. THANK YOU John Mandrola! Shortly after WWII ended, my father spent a couple of months in a veterans’ hospital for an irregular heartbeat. He tells me that the doctors were totally baffled at that time; they even sent him to a psychiatrist for an evaluation. There being nothing they could do, he ended up living with paroxysmal AF. (He is still with us, but at age 87 he is not interested in a catheter ablation, even if he was a viable candidate. He has been on digoxin and warfarin for many years). I am glad times have changed. By comparison, my own 4 year struggle with persistent AF seems like a mere inconvenience. (afib-free for 1 year now). 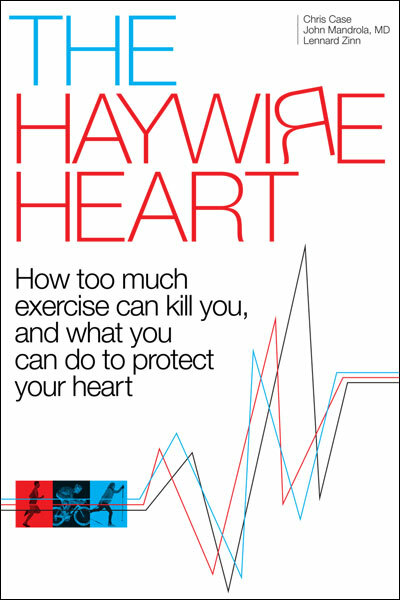 I have fought Heart Arrhythmia for the last 20 years, Pacemaker in 2006 when Amiodarone harmed my lungs. Three months ago I had surgery ablation done by Dr. John Sirak at OSU. http://www.ohioafib.com/ It was like I was a new man Lung Problems decreased by 60% and I can walk and work again. Have you heard about The five box Thoracoscopic maze, the only procedure which completely replicates the critical left atrial lesions of the Cox Maze III. What is your opinion of it? Of course I can not praise it enough and know of numbers of others that have had the same results. He has a better than 95% success. You point out that the rate of AF is increasing rapidly in your article. So my question is, is this due to our aging population, or is the incidence of AF increasing within age groups, and which age groups? Can you reference any studies about the increase of AF incidence? Also, your theory is that the increase in AF is due to us not taking proper care of ourselves, causing inflammation, which leads to AF. Have you considered environmental factors leading to the increase of AF, such as increasing amount of toxins in the environment, or cell-phone radiation (from cell phones and also cell towers)? One would think that the increase in cell-phone radiation could potentially affect our hearts’ electrical system and cause AF to increase. These arent’ things we can do much about, but it would be good to know what the real cause of increasing AF is, and if that’s what’s really causing AF incidence to rise, maybe trying to change our diets is an exercise in futility (although it could have other health benefits).